« Surround Yourself With The Best! A feel good for the weekend!! Happy reading!! 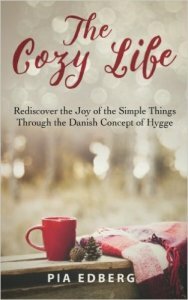 The Cozy Life is a cute, short book about the concept/feeling of hygge and how to bring it into your life. I found out about hygge through a random news article my sister-in -law posted to Facebook a few weeks ago. I fell in love with the idea and immediately began researching it online. One of the first things I found was this book, and since the price was amazing ($4!) I bought and devoured it in only a couple hours!